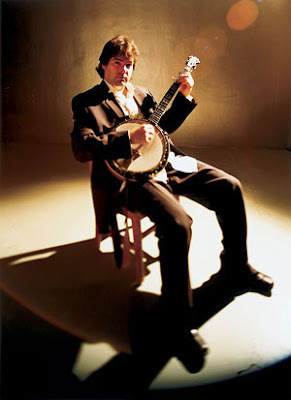 Bela Fleck played at the Blue Plate Special today and it made my heart glad. He's been in Knoxville promoting his new cd and documentary Throw Down Your Heart, where he collaborated with musicians in Africa. If you missed BPS today, don't worry. He's coming back with some of the African musicians he met to play at the Tennessee Theater April 3rd. 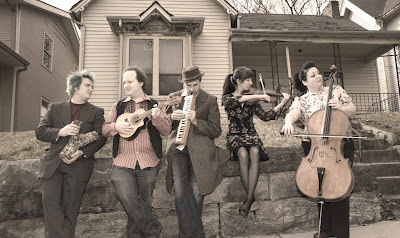 Also playing at the Blue Plate today was a freshly formed, Knoxville-grown band called Shortwave Society. The band features some of the guys from "Same as it Ever Was" and two girls from Norwegian Wood, the String Quartet Tribute to the Beatles. They've put together their incredibly creative forces to produce a unique and engaging sound. They're playing tonight at Barley's in the Old City if you'd like to check them out, but don't expect anything run-of-the-mill from 'em. didn't bela say he may swing through for another screening before the show at the tennessee theater? that documentary was genius, especially in how he captured the music and the personalities of the musicians.